On the 6th of May 1942, the German weapons manufacturer Krupp submitted a proposal for the construction of a new armored self-propelled gun carriage that used components from the Panzerkampfwagen VI Tiger. While it was based on the Tiger tank chassis design, it was radically altered. It was meant to be able to carry two different guns. The vehicle was named, in typical German fashion, the ‘Geschützwagen Tiger für 17 cm Kanone 72 (Sf. )’ or the ‘Geschützwagen Tiger für 21 cm Mörser 18/1 (Sf. )’, depending on the gun mounted. The German word Geschützwagen literally translates to ‘gun vehicle’. This is not an accurate description of the concept behind this artillery self-propelled gun. A gun carriage would be a better description. Unlike other German self-propelled guns, this vehicle was designed to mount different weapons. It was a modular concept. The vehicle was given the shorter names of Grille 17 and Grille 21 depending on what weapon was mounted inside the vehicle. The word German Grille means ‘cricket’ and the letter ‘e’ at the end is pronounced as an ‘a’. The proposal was submitted on 6 May 1942 to the Wa Prüf 4 artillery division of the Heereswaffenamt (HWA) (German High Command’s center for technical weapons development). Krupp was authorized to build a single prototype with a completion date of 1 November 1942. The Wa Prüf 4 made a requirement that the vehicle must have the ability to have a 360-degree traverse. They also wanted it to be available for coastal defense work if necessary. The two guns were too heavy to be mounted in a turret so the Krupp design team had to find another solution. They constructed a large heavy circular base plate that would be carried at the rear of the vehicle and lowered into position when needed. The SPG would then drive onto the metal plate and could swivel on its tracks to point the gun at the target. This was an unusual design feature of this weapon system not seen on any other German vehicle in WW2. Another requirement was that the guns were to be dismountable. This would be achieved by driving backward towards the base plate, after which the gun could be slid out of the vehicle and mounted on the base plate, allowing it to cover 360°. The reasoning behind this feature was that the Grille was also meant to be used in the coastal defense role and this allowed it to fire in any direction. This requirement was dropped in 1944 under the orders of Heinrich Himmler. 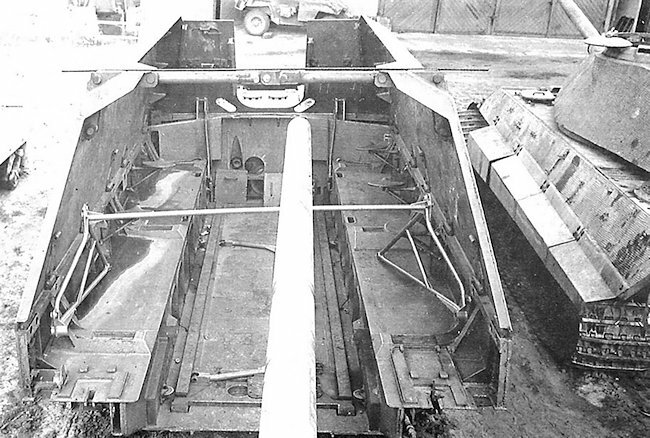 Design and mechanical problems were also encountered with the Tiger chassis, engine and transmission. It did not help that the winner of the competition between the Porsche and the Henschel designs hadn’t yet been decided, and they had vastly different drivetrain arrangements. Initially, the vehicle was meant to have a 30 mm armor plate on the front of the chassis and 16 mm on the sides. 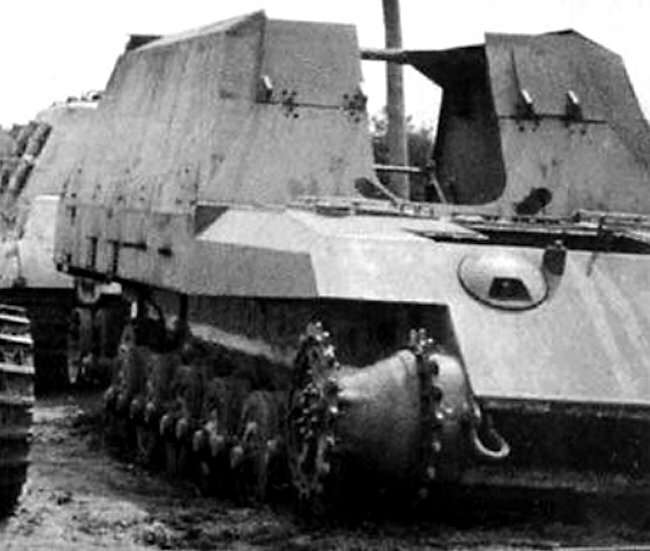 In November 1942, it was decided to use SM-Stahl (carbon steel) in the construction of this self-propelled gun. 50 mm of SM-Stahl carbon steel were used for the front of the vehicle. The sides and rear would have 30 mm SM-Stahl carbon steel. This added to the weight of the vehicle. There were a number of delays in the project. The original 1 November 1942 completion date passed without a prototype being finished. When the Panzer VI Ausf.B Tiger II (Sd.Kfz.182) heavy tanks started rolling out of the factory doors, Krupp decided to use the Tiger II engine, suspension, steering, and transmission instead of Tiger I parts. These components were not ready for delivery until January 1944. This delayed the estimated final construction of the prototype until the summer of 1944. On 25 September of 1944, Reichsminister Albert Speer ordered a demonstration for Adolf Hitler to take place as soon as the vehicle was completed, now planned for the end of the year. Serial production was to then start at the rate of two per month. It was envisaged that two different guns could be mounted in the vehicle: the 17cm Kanone K72 (Sf) L/50 or the 21cm Mörser 18/1 L/31. These two weapons were chosen because they used the same gun carriage and recoil system. 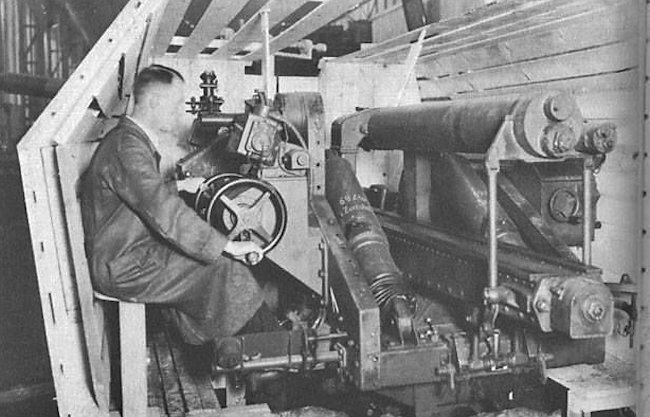 The fittings would be the same when the guns were mounted within the self-propelled gun superstructure. The guns would have had a traverse of 5 degrees left and right from a fixed position. The gun sight was a Z.E. 34 with Rblf.36. Both vehicles would have to be supported by a number of ammunition carrying vehicles. The Grille 17 would have carried 5 rounds plus propellant on board when equipped with a 17cm Kanone K72 (Sf) L/50 gun. It could fire two types of shells, the 68 kg Sprenggranate(HE) with 29.15 kg of propellant and a range of 28,000 meters and the 62.8 kg Sprenggranate(HE) with 30.5 kg of propellant and a range of 29,600 meters. The 21cm Mörser 18/1 L/31 was already in production and use by the Germans when the project started. It was produced to replace the much older 21cm Mörser 16. The 21cm Mörser 18 replaced the 21cm Mörser 16 in front-line service around 1940 with the older gun being relegated to secondary theaters and training units. More than 711 21cm Mörser 18 guns were produced in 1939–45. The Grille 21 would have carried 3 rounds plus propellant on board when equipped with this gun. It could fire a 113 kg Sprenggranate(HE) shell with 15.7 kg of propellant to a range of up to 16,700 meters. A 17 cm (172 mm) gun barrel and breach can be seen on the floor in front of a gun carriage with 21 cm Mrs 18 painted on it. The fate of the gun is not known. 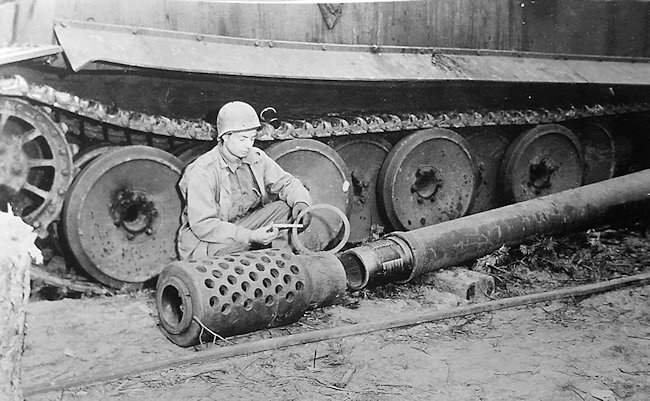 In January 1945, plans were made to mount a 30.5cm caliber smooth bore mortar with fin-stabilized projectiles, due to the concerns over the length of time it took to produce artillery barrels for the two other guns. Krupp and Skoda both competed on this project with Skoda producing a 30.5 GrW L/16 prototype by April 1945. 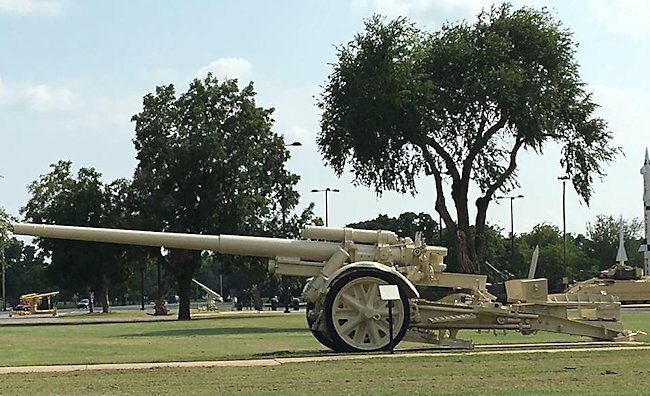 As a side note to armament, in 1945 Kurt Arnoldt, Chief Engineer at Henschel, said in a 1945 interview that the 21cm gun produced too much recoil for the chassis as designed, making it impossible to fire from the chassis. The 17 cm muzzle break was based on a design by Solothurn design. Ammunition would have been stowed both in the vehicle and in wicker baskets on the side of the vehicle as well as in a following 18-ton semi-tracked vehicles (half-track). The gunnery sights also allow for direct firing of the gun on close-range targets. According to a British intelligence report from 1945, the Grille designs meant to have a crew of 8, composed of a driver, a commander and 6 gun crewmen. The loading of the two-part ammunition was meant to be done manually. 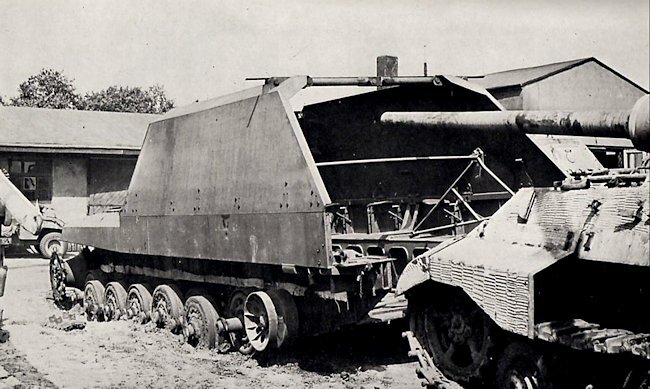 It is stated in a 1945 interview with Kurt Arnoldt, the Chief Engineer for Henschel, that the additional crew would travel in a semi-track vehicle, Kurt Arnoldt suggests the 18-toner, and haul additional ammunition. A Tiger II Maybach HL 230 P30 V-12 water-cooled petrol 690 hp engine was ordered along with a Maybach OG 40 12 16 B gearbox with eight forward and 4 reverse gears. Henschel made the L 801 steering unit. 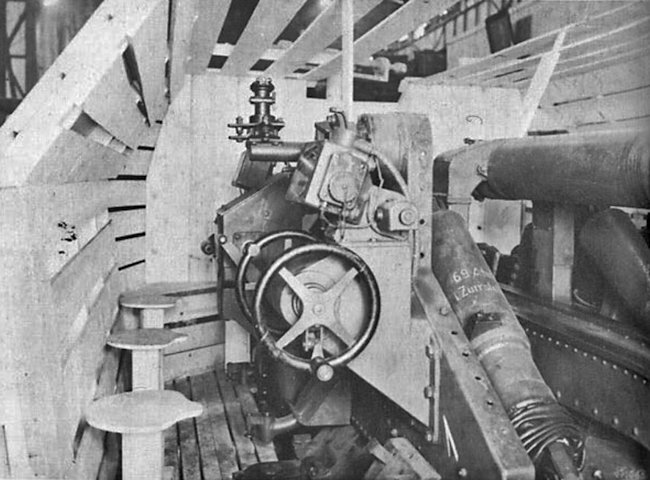 The engine was mid-mounted in the chassis to allow for the maximum amount of room for the large gun and space for the crew. As rubber was difficult to obtain in 1944 the wheels were 80 cm all steel tires. However, the 1945 interview with Kurt Arnoldt suggests rubber rimmed roadwheels. But photos do not confirm this. It was fitted with Gg 24-800/300 Tiger II track for traveling cross country, but this would have been replaced with smaller width Gg 24-600/300 Panther II tank track if transportation by rail was required. More delays occurred when the Allied air force bombed Krupp’s manufacturing plant in Essen. Construction work on the prototype was no longer viable at this location. 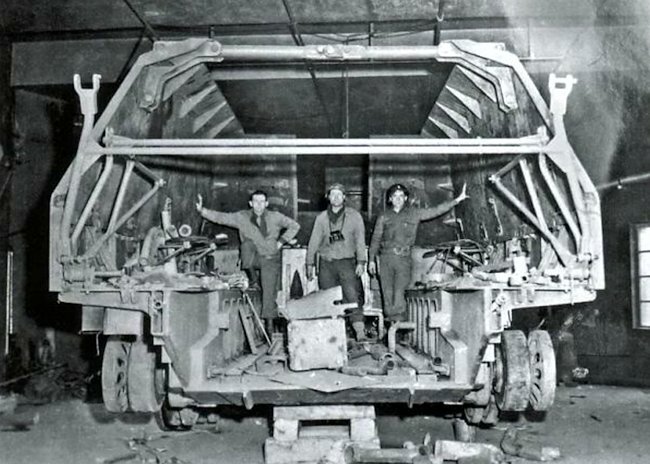 On 7 December 1944 Krupp reported that the chassis was ready to be loaded onto a flat back railway wagon for transportation from Essen to the Henschel Panzerversuchsstation 96, Haustenbeck near Paderborn. It was recorded as being at this establishment on documents dated 22 December 1944 but missing many of the components needed for the completion of the project including the cooling and fuel system, Gg 24/800/300 tracks and hardened road wheel arms. 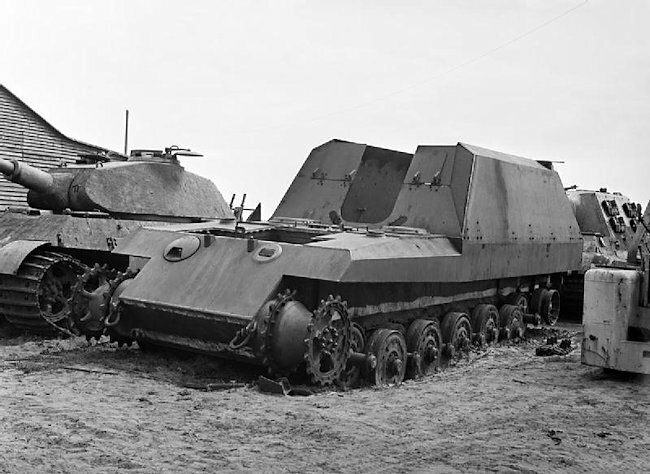 The Grille 17/21 prototype was still in an unfinished condition when the German High Command ordered all future work on the program to be stopped. The situation in the 1st quarter of 1945 was such that in their view there would not be any significant advantage in the completion of the project. Resources were limited and they had to be channeled to more important weapon production lines. In 1945, the US 3rd Army captured the Henschel panzerversuchsstation, Haustenbeck Ordinance proving and tank testing ground in Northern Germany, 50 km south west of Hanover. A selection of German heavy tanks and self-propelled guns were found in working condition. A few prototype vehicles were discovered that never entered production. 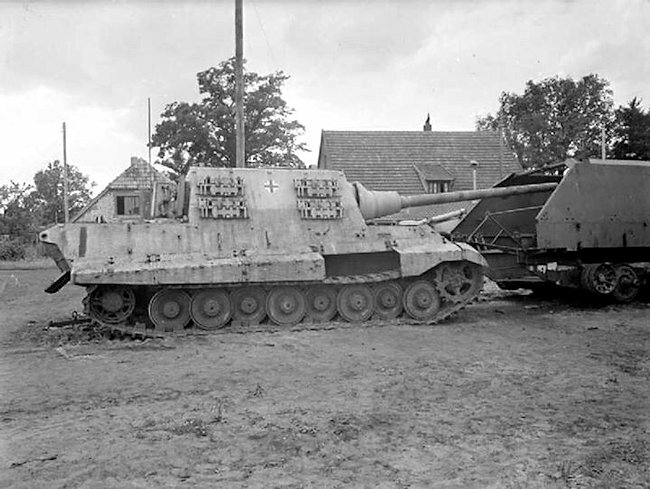 These included a partially assembled Geschützwagen Tiger für 17 cm Kanone 72 chassis and nearby a 17 cm Kanone 72. They did not find a second chassis or a 21 cm Mörser. 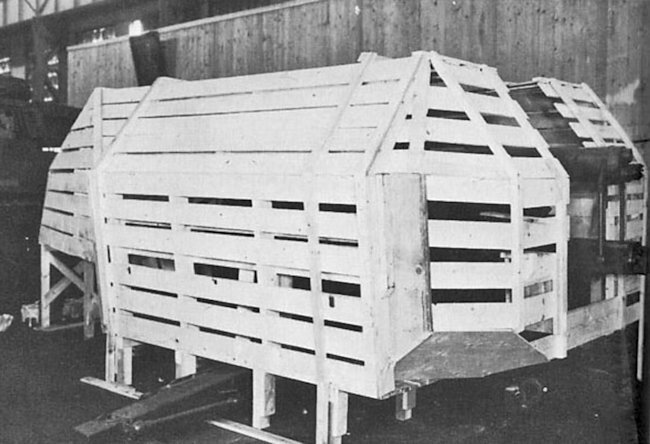 The following photographs are often seen in books and posted on the internet wrongly claiming that they are photographs of a wooden mock-up of the Grille 17/21 fighting compartment. 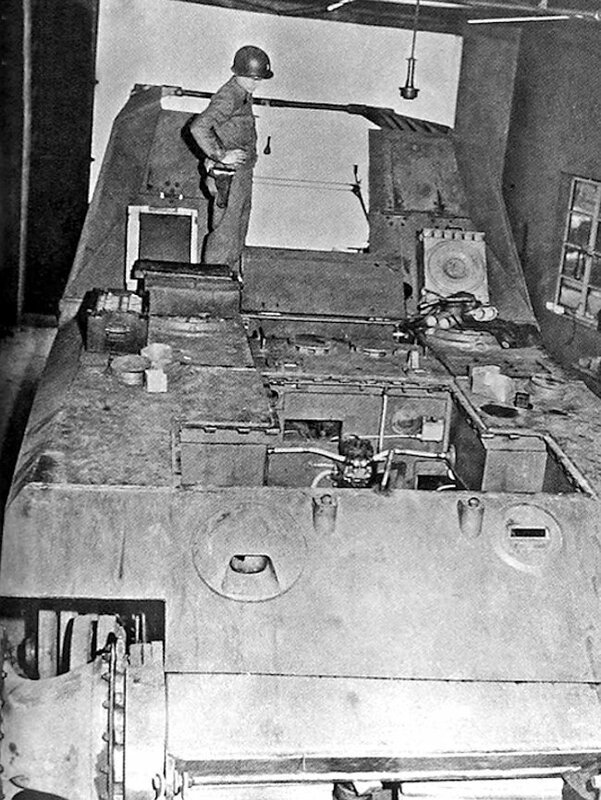 This is a mock-up of the Flakwagen auf Panther NOT the Grille 17/21. The first author to make this understandable error was Spielberger in his book ‘Tiger und seine Abarten’. Frank V.de Sisto, German Artillery at War 1939-45 vol.1. (Concord Publication Co). Gordon Rottman, German self-propelled guns. (Concord Publication Co). Peter Chamberlain, Thomas L.Jentz and Hillary L.Doyle, Encyclopedia of German tanks of WWII, (Arms and Armour Press). The War Office, Handbook of Enemy Ammunition Pamphlet No 15 – 24th May 1945. SHAEF, Restricted July 1944 – Allied Expeditionary Force – German Guns – Brief notes and range tables for allied gunners. SHAEF/16527/2A/GCT. U.S. Army Council. Handbook of Enemy Ammunition Pamphlet No.15. German Ammunition Markings and Nomenclature. Geschützwagen Tiger für 21 cm Mörser 18/1 (Sf.) Grille with the 21 cm Mortar fitted. It is painted in factory fresh Red-Oxide Primer. The length of the gun is noticeably smaller that the 17 cm cannon. The turning dish has not been fitted to the rear of the vehicle. 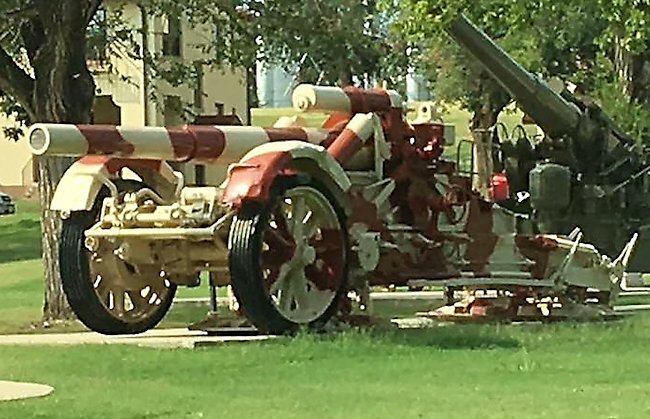 Geschützwagen Tiger für 17 cm Kanone 72 (Sf.) Grille with the 17 cm gun fitted in fictional ‘what if’ markings. Notice the extended chassis and the large turning dish mounted at the rear. I wish people would stop appending the word Nazi in front of the word Germany. There was only one Germany (apart from 1946-1989) and we don’t label any other country the same way. We don’t say Republican America or Labour Britain or Social Democrat alliance Finland or whatever. They weren’t Nazi panzers, they were German panzers, or German tanks. Nazis were a political party. Political parties do not own tanks. We don’t say Conservative Churchill tanks, we say British Churchill tanks, or Australian or Jordanian ones. No where else do we append the nation’s political party to a piece of engineering. Whenever I see the word Nazi at the front of an article it puts me off reading it, because it implies a loaded and/or political opinion will be in the article. Even when it subsequently doesn’t. We’re all history buffs on here, fascinated by technology – we don’t really need reminding of the ideology of the time. We don’t use Nazi Panzers, or Nazi troops, or Nazi Army, or Nazi anything. However, such words are sometimes added to nation names in order to signify certain time periods. Feudal Japan, Socialist Romania (exactly your case), Civil War America, etc. All the best and keep being awesome! Skoda produced a prototype interesting, no known photos I assume? The photo in the top left that purports to be of a 17cm K-18 is actually that of a 15cm K-18. If you compare it with photos of the actual 17cm K-18 you will be able to tell the significant differences between them, since the 15cm K-18 was of a more conventional box trail design. This particular gun used to be at the Aberdeen Museum in Maryland and I had several chances to see it in person. I am disappointed that they are still keeping it outside in the elements, but it is interesting that they managed to put it in firing position after it had been in the towed configuration for decades at Aberdeen.